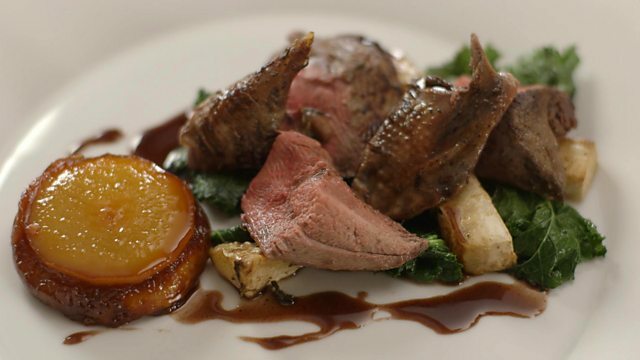 This is a very impressive seasonal game dish for an autumn dinner party, with stunning presentation. Preheat the oven to 200C/180C Fan/Gas 4. Grease a six-hole muffin tin or silicone muffin mould with a little butter. Half-fill a medium saucepan with water. Add half of the sugar, the juice from one lemon half, plus the lemon halves themselves, and the pears. Bring the mixture to a simmer and poach the pears for 12-15 minutes, or until tender. Remove the pears from their poaching liquor and set aside until cool enough to handle. When the pears have cooled, heat the remaining 75g/3oz of caster sugar in a frying pan over a low heat, until it melts and turns golden-brown. Add a knob of the butter (about 25g/1oz) and swirl it around the pan, without stirring, until well combined (this reduces the temperature of the molten sugar). Pour a little of the caramel into the bottom of each hole in the prepared muffin tin, then tilt the muffin tin until the base of each hole is coated evenly in caramel. Set aside to cool slightly. Slice 2 thick discs from the bottom of each pear, then place one disc into each muffin hole. Stamp 6 pastry discs from the sheet of puff pastry, each 1cm/½in bigger than the holes of the muffin tin. Tuck one around each pear disc, then bake in the oven for 10-15 minutes, or until the pastry has risen and is golden-brown and cooked through. Remove the mini tartlets from the oven and set aside to rest, in the muffin tin, for 1 minute. Turn out the mini tartlets by placing a serving plate on top of the tin, then turning it over, so that the tartlets slip out onto the plate. Season the grouse, inside and out, with salt and freshly ground black pepper. Heat about 25g/1oz of the remaining butter in a large frying pan over a medium heat. When the butter is foaming add the grouse, breast-side down, in batches if necessary, and fry until golden-brown on the crown and legs. Transfer the grouse to a roasting tray (lay them on their backs) then sprinkle over the thyme. Add the celeriac to the roasting tray. (If you used lemon juice to prevent the celeriac from browning then drain it off and dry the celeriac before adding to the roasting tray). Roast in the oven for 15-20 minutes, or until the grouse is cooked through but with a trace of pink (or for longer until cooked to your liking). Transfer the contents of the roasting tray to a warmed plate and set aside for the meat to rest. Add the port to the roasting tray, then bring it to the boil, scraping any burnt bits from the bottom of the tray using a wooden spoon. Reduce the heat until the mixture is simmering, then simmer until the volume of port has reduced by half. Add the chicken stock and return the mixture to the boil, then simmer for a further 10 minutes, or until the volume of liquid has reduced by one-third. Strain the sauce through a sieve into a clean pan, then whisk in half of the remaining butter. Season, to taste, with salt and freshly ground black pepper. Wilt the kale in a hot frying pan with the remaining butter and a splash of water, stirring as the kale fries and wilts. Season, to taste, with salt and freshly ground black pepper. To serve, arrange a line of celeriac pieces down the centre of each plate. Top with the kale. Carve the legs and breast from the grouse and cut each breast in half. Place one grouse onto each plate. Place one tartlet alongside. Drizzle the port sauce over the meat. Tip 1: When preparing the pears and celeriac, pop them into a bowl of water with a squeeze of lemon juice added to it - this will prevent them from turning brown. Tip 2: To make concentrated chicken stock, bring 400ml/14fl oz of chicken stock to the boil, then simmer until the volume of liquid has reduced to 200ml/7fl oz. Tip 3: The remaining poached pears can be used for dessert with ice cream, or can be frozen for another occasion.